Suntec REIT's 4Q18 DPU of 2.59 Scts (-0.5% y-o-y) in line withexpectations. Turnaround of Suntec City Mall underway withnormalised 4Q18 NPI up 16% y-o-y. 10% positive rental reversions at Suntec City Mall andupturn in the office market to drive earnings ahead. We maintain our BUY call on SUNTEC REAL ESTATE INV TRUST (SGX:T82U, Suntec REIT) with a Target Price of S$2.12. Since early 2018, more sell-side analysts have joined us in being bullish on Suntec REIT. As there is mounting evidence of a sustained turnaround at Suntec City Mall, spot office rents at an upward trajectory and underlying DPU to improve by 3-4% p.a. between 2018-2021, we believe more investors and other sell-side analysts will be convinced that Suntec REIT is undervalued. 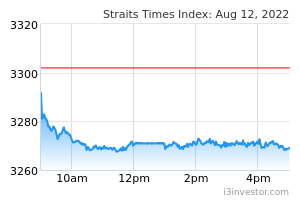 We have a street-high target price of S$2.12 compared to consensus target price of S$1.86. 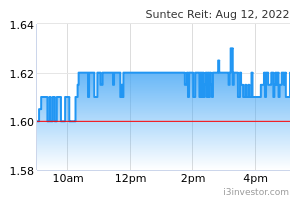 We believe Suntec REIT deserves to trade towards our target price, given office buildings and shopping malls in Singapore have been recently sold on 1.7-2.7% and 3-4% exit yields respectively, below the cap rates of 3.65-3.90% and 4.75% used to value Suntec REIT's office and retail properties. Furthermore, with office rents expected to be on a multi-year upturn, we believe Suntec REIT should at least trade close to its book value. Passing rents at Suntec City Mall of S$11 psf/mth are at a significant discount to other suburban malls of up to S$17-18 psf/mth. We believe as Suntec REIT remixes its tenant mix and picks the low-hanging fruits such as placing children stores next to the playground rather than at opposite ends of the mall, the resultant higher foot traffic, tenant sales and improving rents should act as re-rating catalysts. The key risks to our bullish view are a downturn in the office ket and the failure to revitalise Suntec City Mall. Suntec REIT's 4Q18 DPU came in at 2.59 Scts, down 0.5% y-o-y with FY18 DPU of 9.988 (-0.2% y-o-y) in line with our FY18 estimate of 10.0 Scts. Excluding S$12.5m worth of capital distributions in 4Q18 which was higher than S$10.0m distributed in 4Q17, underlying 4Q18 DPU fell 4.7% y-o-y to 2.124 Scts. Meanwhile, underlying FY18 DPU was reported at 8.529 Scts, down 4.2% y-o-y after stripping out S$39m worth of capital distributions (S$29m in FY17). The decline in underlying 4Q18 DPU was largely due to the impact of the larger number of units on issue and higher borrowing costs (+28% y-o-y) which is a consequence of higher debt balance and interest rates. Nevertheless, 4Q18 revenue and NPI grew 7.0% and 2.3% y-o-y to S$93.5m and S$60.7m. 4Q18 NPI would have increased by 10.4% y-o-y stripping out the S$4.8m contributions to the sinking fund as part of Suntec City’s office upgrading works. The sinking fund contributions have no impact on DPU. The improved property income was attributed to the sustained turnaround of Suntec City Mall, steady performance from Suntec City Office as well as higher contributions from 177 Pacific Highway despite the depreciation of the AUD. The results were also boosted by the acquisition of an additional 25% interest in Southgate Complex earlier in the year with underlying Southgate Complex income up 10% y-o-y owing to better office occupancy (98.8% vs 90.7%). This helped offset lower associate income from One Raffles Quay (ORQ) which fell 14.9% y-o-y. The weaker performance was due to a drop in occupancy to 96.1% from 100.0% in the prior year. Meanwhile, contribution from MBFC Tower 1&2 were stable at S$13m. The turnaround at Suntec City Mall continued into 4Q18, with 4Q18 revenue and NPI (excluding S$2.1m sinking fund contribution) increasing by 2.7% and 16.3% y-o-y to S$30.6m and S$25.0m respectively. The stronger financial performance was due to better occupancy (99.6% versus 98.5% in 3Q18 and 99.0% in 4Q17) as well as higher signing rents achieved in prior quarters. Operating metrics for the mall also improved, with foot traffic up 4.8% y-o-y for FY18 (+5.5% y-o-y for 9M18) and tenant sales jumping 5.2% y-o-y for FY18 (+5.4% y-o-y for 9M18). We understand Suntec Mall was able to achieve 10% positive rental reversions for the whole of FY18. With management guiding for at least 5% rental reversions in FY20, we believe this bodes well for continued improvement in earnings over the course of the next few years. 4Q18 revenue and NPI for Suntec City Office fell 0.6% and 6.9% y-o-y to S$32.7m and S$24.4m respectively. However, stripping out S$2.1m contribution to the sinking fund, 4Q18 NPI would have risen by 1.1%. The steady performance at Suntec City Mall was credible and committed occupancy was steady at 98.6% versus 99.5% in 4Q17. Given Suntec achieved signing rents of S$9.14 psf/mth as compared to S$8.86 psf/mth signing rents reported 3 years ago, we understand Suntec City Office was able to achieved 3% positive rental reversions over the quarter. On the back of forward renewals, only 8.2% of office leases by NLA are up for renewal in FY19, lower than 10.9% previously. We understand the majority of the remaining leases are weighted towards 2H19, which potentially provides greater upside to signing rents assuming spot office rents maintain an upward trajectory. For FY20, 17.6% of leases are up for renewal. Going forward, with spot office rents expected to maintain its upward trajectory, we expect signing rents for Suntec City Office to be 3-5% higher versus expiring rents. Suntec REIT reported revaluation gains of S$110.2m largely due to 0.1-2.7% increase in the value of its Singapore properties as a result of an improvement in earnings and marginal compression in cap rates for Suntec City Mall (4.75% versus 5.0% previously) and Suntec City Office (3.9% versus 4.0% previously). Despite an increase in asset values, aggregate leverage was stable at 38.1% largely due to increased borrowing to fund the construction of 9 Penang Road (60% completed) and 477 Collins Street (52% pleted). NAV per unit marginally increased to S$2.10 from S$2.08 at end 3Q18. Average borrowing costs dipped slightly to 2.82% from 2.86% in the prior quarter. Meanwhile, the proportion of fixed rate debt increased to 75% from 70% in 3Q18 as Suntec took advantage of a flatting of the yield curve in recent weeks. Around 60% of 9 Penang Road development has been completed with construction on scheduled to be completed at end 2019. Thus far, Suntec REIT is deliberating over offers from a prospective tenant to take the entire building or focus on having a multi-tenanted building instead. Meanwhile, construction for 477 Collins Street remains on track for completion by mid-2020 with 52% of the building now completed. In terms of leasing, Suntec REIT has entered into a heads of agreement for another 16.2% of the building, taking overall pre-committed occupancy to 82.0% from 65.8% currently. There were some concerns that following the appointment of new CEO, Mr Chong Kee Hiong in late 2018 that Suntec REIT would remove capital distributions that had supported Suntec REIT maintaining an annual DPU of 10 Scts. Management guided that it remains keen to maintain a stable DPU but may pursue acquisitions to close the current shortfall between 10 Scts and underlying FY18 DPU of 8.53 Scts. Suntec would focus on deepening its presence in Australia. Given tight cap rates for CBD properties in Sydney and Melbourne, Suntec would consider properties in CBD Perth and Brisbane or fringe CBD properties in Sydney or Melbourne, similar to its existing 177 Pacific Highway property. With 4Q18 in line with expectations and underlying earnings expected to improve on the back of higher spot office rents in Singapore and continued turnaround of Suntec City Mall, we maintain our BUY call and Target Price of S$2.12.